The Nabtesco Group proactively promotes contributions to local economic development through the establishment of a production system for "locally produced and locally consumed," solutions for social challenges through the provision of our products and services, and community investment activities. In FY2012, the Group established the "Nabtesco Way," which consists of Nabtesco's Corporate Philosophy, Our Promises, the Action Guidelines, and Action Declaration. In the Action Guidelines, which targets all the employees, we set a rule to proactively engage in exchange, cooperate with local communities and promote harmony with them and their culture though participation in social activities and others in order to grow with society. In addition, in the "Nabtesco Group's CSR Basic Policy," which was established in FY2016, we identified 12 items including development of the local community as materiality (Material CSR issues) to indicate our policy of proactively implementing activities to achieve the Sustainable Development Goals (SDGs). Furthermore, in FY2018, we established the "Nabtesco Group Community Investment Policy," which clearly defines the policies, targets, and priority areas of activities regarding the development of the local community, which is one of the materiality, and organized our concept of the group-wide community investment activities. The policy clearly states that through our community investment activities, we will proactively engage in exchanges and cooperate with local communities in fields closely related to its business in each region where the Group conducts business as good practice of the "Nabtesco Way." The policy states the targets of the activities as the values created for stakeholders to contribute to solving global social challenges and social challenges faced by local communities in each region where the Group conducts business. It also states that we will pursue the targets as the Group values, which are to encourage employees’ challenging spirit and innovative ways of thinking by contributing to solving social issues in fields related to the Group’s business and to increase the Group’s brand value. Moreover, based on the values created for both parties, we aim to foster the growth of both the Nabtesco Group and local communities and to build long-term relationships of mutual trust. We have set environment, education, and welfare as priority areas of our activities. Those three areas are highly related to the sustainable business activities of the Group and correspond to the materiality, and are also associated with the 12 items of SDGs. Through the proactive promotion of community investment activities, the Group will work to establish a trust relationship with local communities while contributing to their development. The Nabtesco Group believes that employees’ participation in local community contribution activities helps nurture diversified values and establish trust with the communities in which we operate, thus we are actively providing relevant support and information to employees. In addition, to promote employees’ community contribution activities, our working regulations provides for the use of accumulated leave for participating in volunteer activities organized by international NGOs. Nabtesco Automotive Products (Thailand) Co., Ltd. and Nabtesco Power Control (Thailand) Co., Ltd. have been conducting a mangrove planting activity on tideland located within the premises of the Bang Pu Nature Education Center in the province of Samut Prakan, aiming to contribute to interaction with the local community and solutions to regional environmental issues. The activity was carried out three times in the past. In August 2017, the two companies conducted the fifth event jointly. A total of 180 employees and their families planted 600 mangrove seedlings, taking the cumulative total number of seedlings planted in this activity to 2,850 so far. Mangroves grow in intertidal zones where seawater mingles with fresh water, and there are hopes that mangroves will help purify marine water, maintain and recover ecosystems, mitigate the damage caused by natural disasters, and prevent global warming. The Nabtesco Group will continue to regularly conduct social contribution activities into the future. We developed the Assist Wheel® (AW) to help ease the physical burden of caretakers of wheelchair-bound people in moving their chargers from place to place. The AW is an electric wheelchair equipped with a sensor that automatically switches on the motor and brake and delivers superior performance, especially on both ascending and descending slopes, irregular ground and other places where moving ordinary wheelchairs is difficult. Since FY2008 we have been donating AW wheelchairs to local governments in areas in which the Nabtesco Group has bases or where many of its employees reside, aiming to contribute to interaction with the local community and encourage employee’s challenging spirit for solving social issues. We also began donating the AW wheelchairs to areas afflicted by the Great East Japan Earthquake in FY2011 and the Kumamoto Earthquake in FY2017, where the superior performance of the wheelchairs on irregular ground is particularly useful. So far, We have donated 302 AW wheelchairs in total. In addition to the AW wheelchairs, we have also begun donating the CONPAL. The CONPAL is a caster walker that automatically decelerates only at times of rapid acceleration, to prevent falls. This new and reliable walker is available for those who walk with instability, or who have difficulty walking down slopes or applying a hand brake. We aim to be able to contribute to improving the lives of even more people through the provision of the AW wheelchairs and COMPAL. The grip sensor detects the force being used to operate the wheelchair, and the electric motor assists the caregiver on slopes and pebbled paths. The electric wheelchair thus reduces the burden imposed on caregivers. NAM: Nabtesco Automotive Corporation TSP: TS Precision Co., Ltd. The acceleration control brake is built into the rear wheel. The brake of the walker does not operate at usual walking speed but only at quick acceleration to prevent turnover. In order to contribute to the development of next-generation human resources as a member of the local community, the Nabtesco Group invites students, teachers and general citizens to its plants and other facilities for tours and internship programs. In FY2017, the Group hosted 331 groups comprising 2,485 people in such events held to foster exchange with local people. Nabtesco has been supporting Environmental Education Program hosted by Asahi Shimbun Company, the newspaper company, since FY2014. The Program is held to help children learn about the Earth in a pleasant manner, and encourage them to voluntarily take actions for the planet. 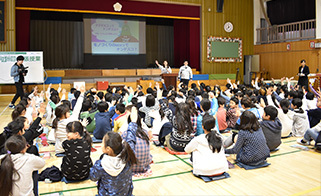 Under the Program, free-of-charge educational materials, which Asahi Shimbun created with four supporting companies including Nabtesco, will be distributed to 245,000 children in about 2,900 elementary schools located across Japan (as of FY2016). Moreover, an environmental event will be held in September, special classes will be provided at elementary schools in November and December, and participatory events will be held for the children, who will be asked to write articles and essays for some of the events. The Nikkei Education Challenge is an education program in which career professionals provide classes for high school students based on the concept of conveying the pleasure of working and their enthusiasm for their jobs. 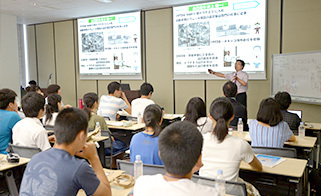 Since FY2015, we have sponsored this program, which is hosted by Nikkei Inc., the newspaper company. On the day, approximately 300 high school students from all over the nation took part in the program. The lecturer conveyed his pleasure of working, the sense of achievement he gets from his job, and examples of challenges he overcame, providing a "lively class" that conveyed a real working site. We will continue to provide opportunities for high school students to imagine their future careers. 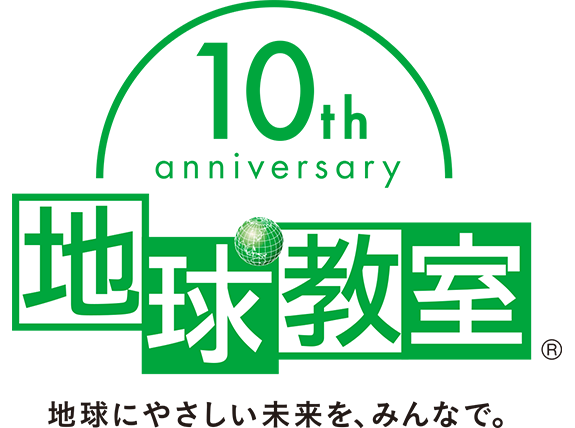 Since FY2017, the Nabtesco Group, in partnership with DyDo DRINCO, INC., the beverage manufacturer, has hosted a soccer championship in Mie Prefecture Japan, where both companies have operational bases. Given the decrease in the number of children joining soccer teams and the widening gaps in performance levels between teams, this championship aims to provide children with an opportunity to participate on an equal footing, thereby offering more opportunities for exchange between teams and developing the next generation through sports. With approximately 650 children participating, the second championship, held in February 2018, was great success.